After four astounding, breathtaking and exhilarating games, it is now clear which teams will be fighting for a spot in this year UEFA Champions League final. There were goals upon goals, from a very wide variety of boots and we have now collected it all together here. We bring you the very best boot spots and the updated table, for the top 5 most scoring boots from the tournament. We are at it again. The seemingly endless wait between Champions League rounds is upon us again, but before we get too sombre, let us cheer ourselves up with a look back at the just finished quarter-finals. There were goals in abundance and if you were having trouble distinguishing between them, then we can now help you. If you're interested in which boots poked the ball over the line the most times in any case. 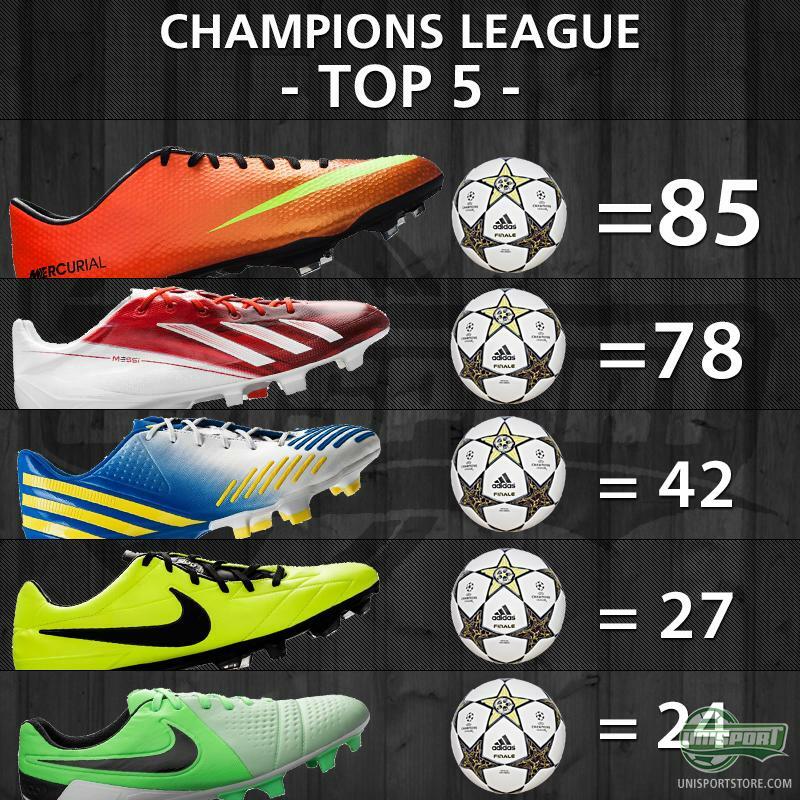 We have updated our Top 5 for most scoring boots in the CHL and it now looks as can be seen above. 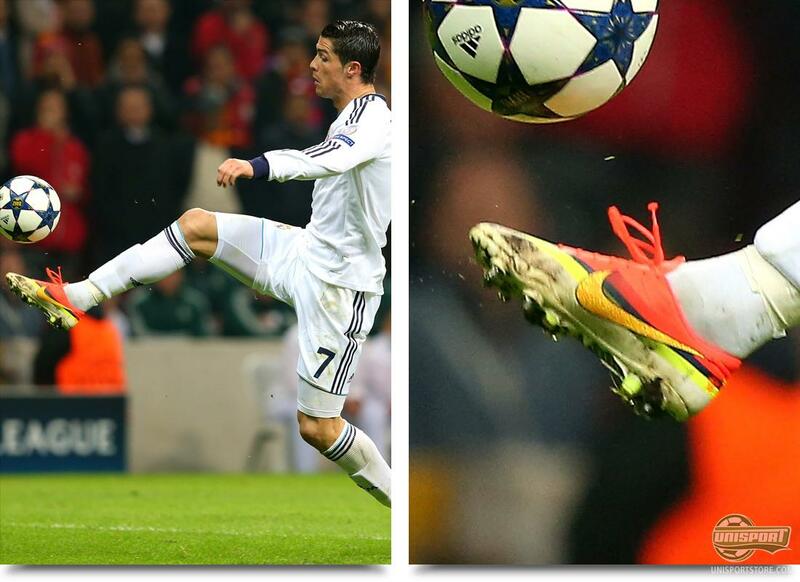 Cristiano Ronaldo (Real Madrid)  Nike Mercurial Vapor IX ACC CR7 As the men from Madrid took a 3-0 lead from the first leg into the game, it all looked done and dusted and when Ronaldo scored in the games first 10 minutes, you would have thought it was lights out. Nothing could however have been further from the truth and it was only when Ronaldo again thundered the ball into the net, with his Vapor IX CR7, that the fans from Madrid could breathe a sigh of relief. Emmanuel Eboué (Galatasaray)  Puma Evospeed 1 Green/Blue/White The former Arsenal player did his bit to try and keep the Turks hopes of advancing alive, as he cannoned the ball into the top corner. When the ball left his Puma Evospeed 1 Green/Blue/White there went a rush through the famed home crowd and this was the goal that sparked what would turn out to be a very nerve racking affair. 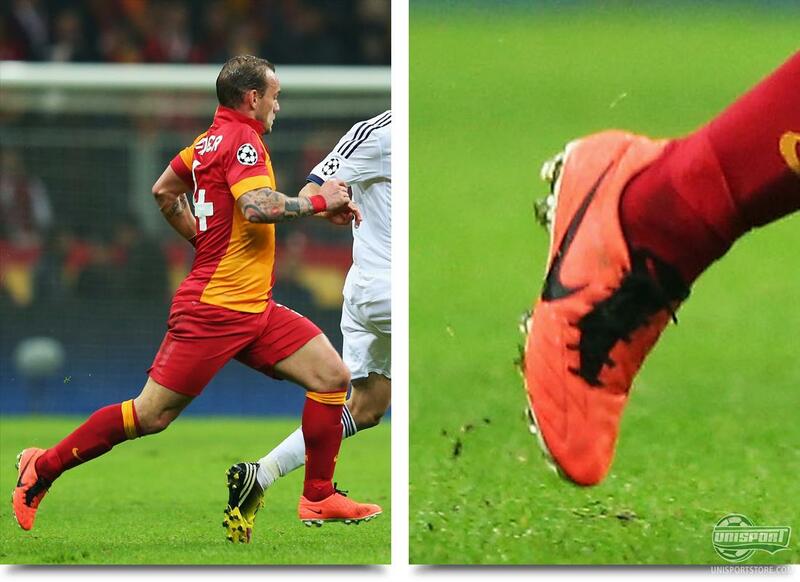 Wesley Sneijder (Galatasaray)  Nike T90 Laser IV ACC Mango/Black The Dutch midfielder proved that he could still perform at the very highest level. Like we were used to seeing him for Inter, he took a smart touch past a defender and then he fired the lazer, with his Nike T90 Laser IV, excuse the pun. Didier Drogba (Galatasaray)  Nike Mercurial Vapor IX ACC Neptune Blue/Volt/Tide Pool Blue Jóse Mourinho had the pleasure of facing quite a handful of the players, whose careers he helped shape. On top of previously mentioned Sneijder, he also got the chance to face up to arguably his biggest fan, Didier Drogba, who scored what can only be described as a dream goal. Wearing his Nike Mercurial Vapor IX ACC Neptune Blue/Volt/Tide Pool Blue he made it look shamefully easy to muscle out Rafael Varane and backheel it past the stunned goalkeeper. Unfortunately, this was not enough for Galatasaray, but they definitely leave the CHL, with their honour well intact. 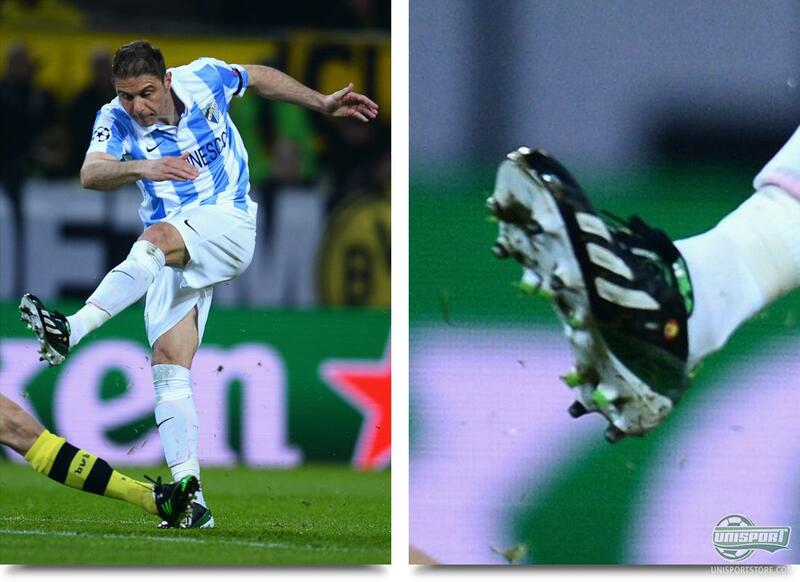 Joaquin Sánchez (Malaga)  Adidas F50 Adizero Black/Green/White The German home-side from Dortmund got quite the fright, when Joaquin brought the Spaniards from Malaga in front. 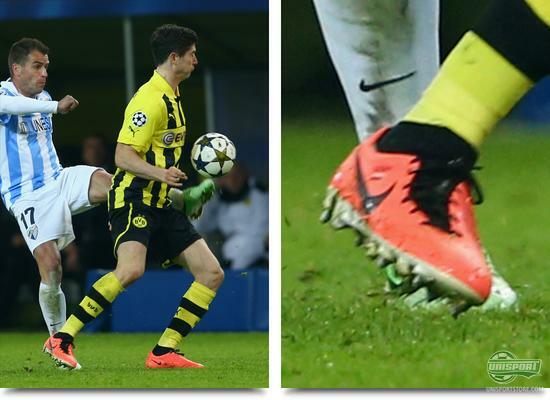 In his Adidas F50 Adizero Black/Green/White he did a smart little dummy shot, before he put the ball between the legs of Subotic and in behind Weidenfeller. Robert Lewandowski (Dortmund)  Nike T90 Laser IV ACC Mango/Black Throughout this season, whenever Dortmund were in a pinch the first man they turned to was the ever lethal Pole. As you would expect it was Robby who had the last touch, as the Germans knocked in the equaliser. After Malaga had lost the ball, it took less than 10 seconds, before the ball was in the back of their net, thanks to his Nike T90 Laser IV ACC Mango/Black. Isco (Malaga)  Nike Mercurial Vapor IX ACC Neptune Blue/Volt/Tide Pool Blue Through lack of a picture of Eliseu, who scored Malaga's goal to make it 1-2 in a pair of Vapor VIII Retro/Total Orange/Challenge Red, we will instead bring you an interesting close-up of Isco's boots from the game. 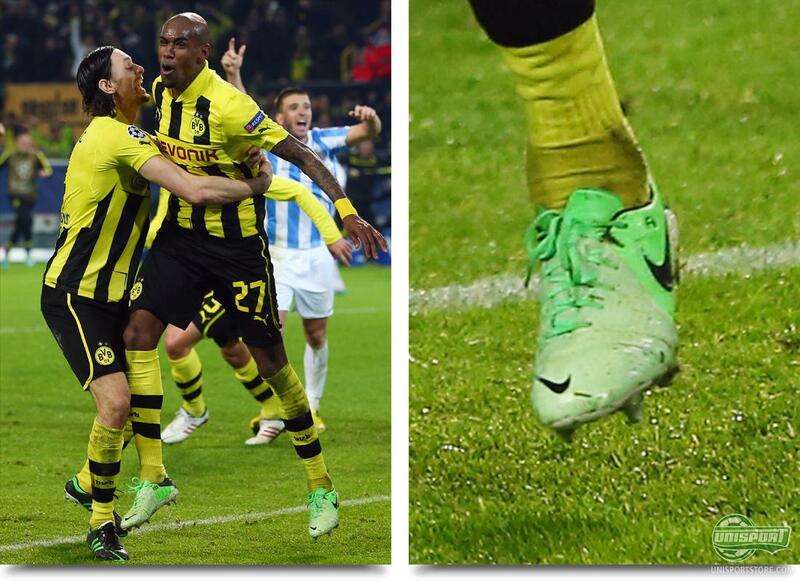 In the first half he played in these Nike Mercurial Vapor IX ACC Neptune Blue/Volt/Tide Pool Blue and as some of you may have noticed, they are a little out of the ordinary. They were equipped with the stud-configuration from a pair of Vapor VIII, but even though Nike had been kind enough to supply him with this, he apparently wasn't happy and in the break he changed into a pair of Vapor VIII Mango/Black. Marco Reus (Dortmund)  Puma Powercat 1.12 SL White/Red/Blue BVB's threatening position at this point was definitely not down to a lack of chances and especially Marco Reus missed a very big chance. Luckily for him he would set things right, when he kick-started a crazy comeback in injury time. 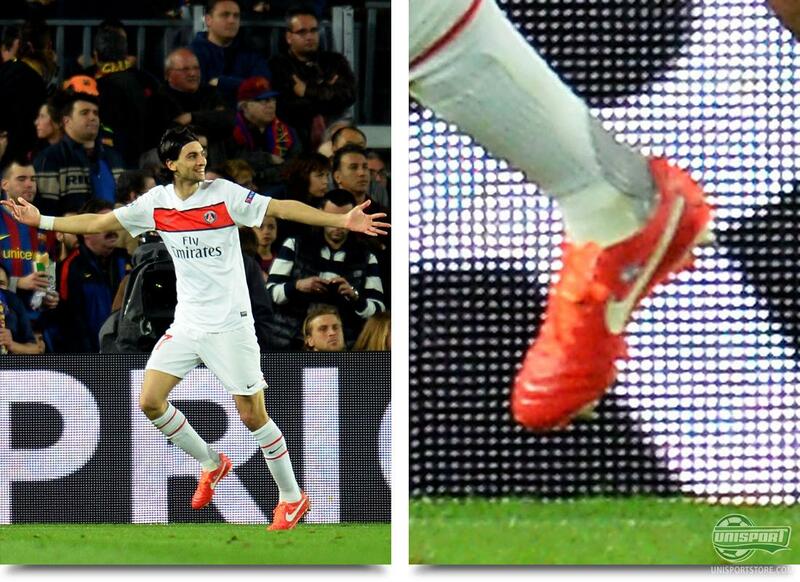 In his Puma Powercat 1.12 SL he scraped the ball over the line and then suddenly it was 2-2. Felipe Santana (Dortmund)  Nike CTR360 Maestri III ACC Fresh Mint/Black - Neo Lime Mats Hummels was demoted to the bench and instead it was Felipe Santana who took his spot in the starting line-up and you could imagine Jürgen Klopp is feeling quite pleased with himself on the background of that decision. As it was the lanky defender who did the impossible, the inconceivable and scored the second goal in injury time. He wrote himself into the annals of history, as he scored the 3-2 goal, while wearing a pair of Nike CTR360 Maestri III ACC Fresh Mint/Black - Neo Lime. Javier Pastore (PSG)  Nike Tiempo Legend IV ACC Sunburst/White/Total Crimson El Flaco definitely shut down the party at the Camp Nou, when he brought PSG infront 1-0. A quick attack ended at the feet of Javier Pastore and his Nike Legend IV ACC Sunburst/White/Total Crimson and just as the attack looked to be running away from him, he still managed to chip it over Victor Valdes and then it was the French with their foot in the Semi's. 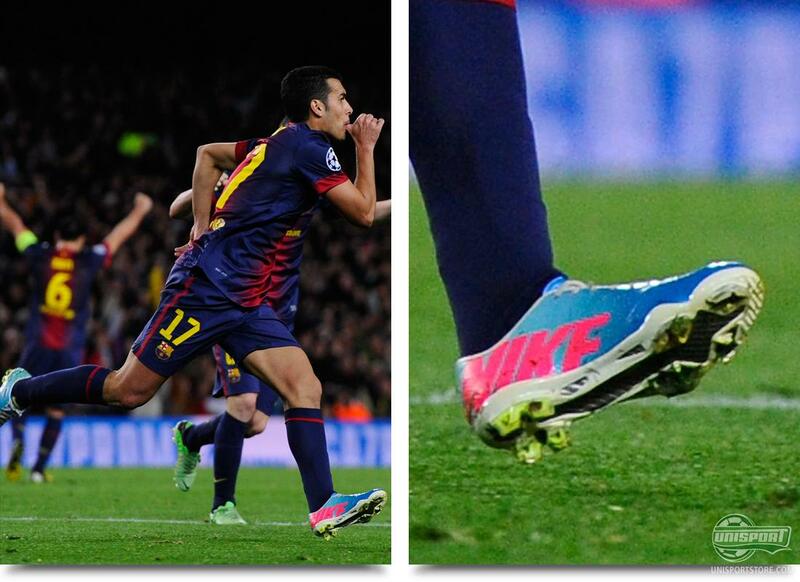 Pedro Rodriguez (Barcelona)  Nike Mercurial Vapor IX ACC Neptune Blue/Volt/Tide Pool Blue Custom Lionel Messi started on the bench for the Catalans, but the minute they fell behind he was told to warm up. In the end it took a few trademark touches from the Argentinian, to make sure that Pedro could brilliantly knock the ball into the back of the net. 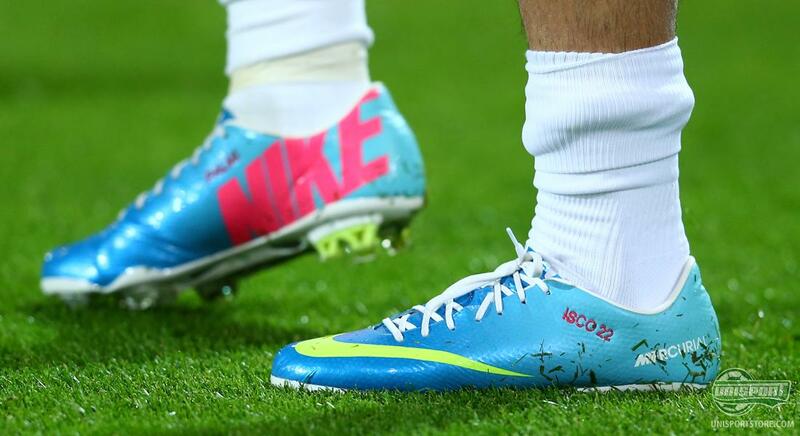 He did so in a pair of Custom Vapor IX ACC Neptune Blue/Volt/Tide Pool Blue, which like his compatriot Isco, where equipped with a Vapor VIII stud-configuration. Dani Alves (Barcelona)  Adidas F50 Adizero Our sharp followers where quick to raise our attention to the fact that Alves was, in the training sessions leading up the clash, wearing a pair of Adidas F50 Adizero Blue/White/Purple, which he had pimped up a bit with some red lacing. These were also the boots he started off with, but not very long into the game he had to change back to his faithful Adidas F50 Adizero White/Lime/Black, which he has been using avidly for a long time now. 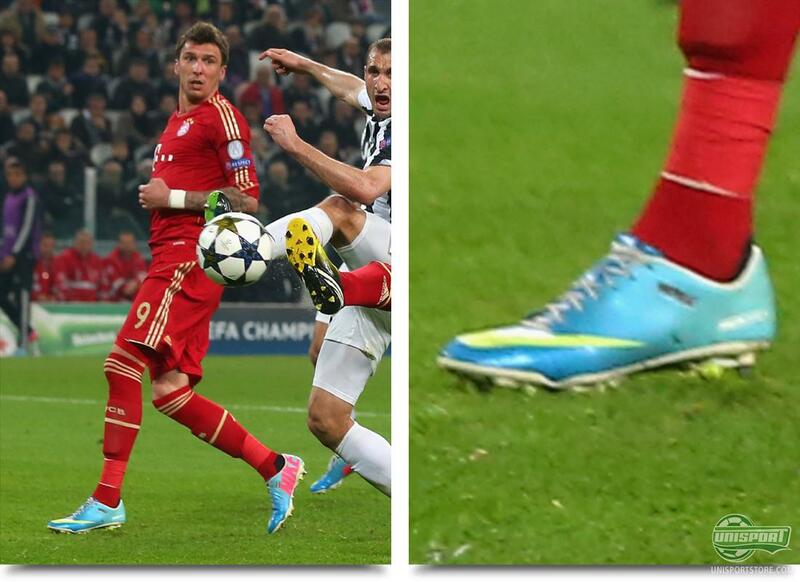 Mario Mandzukic (Bayern Munich)  Nike Mercurial Vapor IX ACC Neptune Blue/Volt/Tide Pool Blue The newly crowned German champions show no signs of stopping their impressive all conquering form and steamed past Juventus in the Champions League. They won 2-0 at home and did the same in the return leg in Turin. The first goal was scored by the fox in the box, Mario Mandzukic, who was wearing a fresh pair of Nike Mercurial Vapor IX ACC Neptune Blue/Volt/Tide Pool Blue. 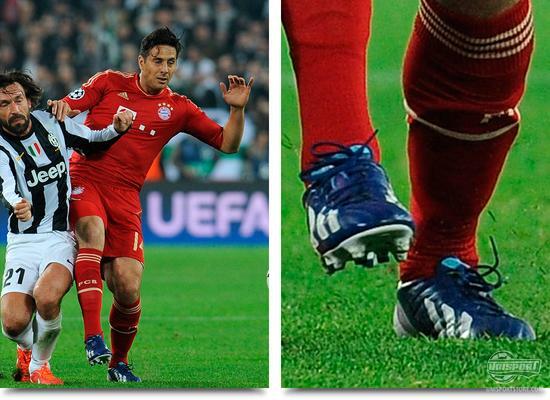 Claudio Pizarro (Bayern Munich)  Adidas F50 Adizero Blue/White/Purple Should you be in doubt as to the depth of the Bayern squad, then all you would need to do is take a look at their selection of strikers: Mandzukic, Müller, Gomez and Pizarro. The last of the formerly mentioned always seems to grab the chance when it comes his way. 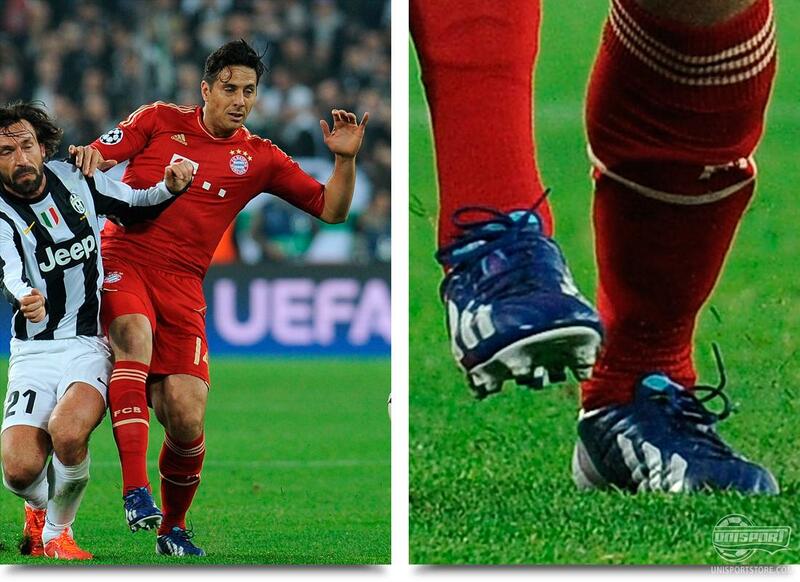 He was substituted on and was not slow to capitalise and scored wearing his Adidas f50 Adizero. Goals, goals and more goals! The semi-finalists have been found and a Germany vs. Spain final looks to be on the cards. Dortmund, Real Madrid, Bayern Munich and Barcelona are all still in with a chance of winning the trophy with the big ears, but who do you think will do it?? Share your thoughts with us in the comment-section down below.